Harmony is central to the concept of all internal martial arts systems. 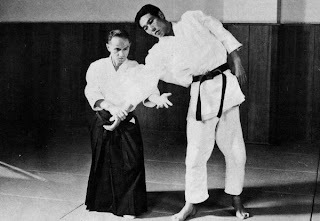 Aikido, tai chi chuan, bagua, and others were developed to "accept" what the opponent has to offer, and then take it from there. Novice sparring sessions often resemble a train wreck, whereas seasoned fighters glide and move with effortless ease. Indeed, the best fighters often do very little. Old time boxing fans should remember Willie Pep, the elusive world featherweight champ from the 40's. Pep reputedly won a round in a fight without throwing a single punch! His strategy to boxing was to let the other guy "punch himself out". Conflicts of any kind can be approached along similar lines. Going with the flow (an idea within the Chinese Tao), is simply accepting what is. What is could be the loss of a job, having a disability, or anything else we find unacceptable or disheartening. In accepting these "blessings in disguise" we can discover areas of our lives we never knew could exist. The magic of martial arts training allows us to fully realize what these possibilities can be. "What is could be the loss of a job, having a disability, or anything else we find unacceptable or disheartening." Wow! You must have been reading my mind. This has been the topic most occupying my thoughts lately. I've been thinking how one can pull out goodness in the worst of moments just by changing their perspective. Bruce Lee, the under-rated philosoph said it too. Perspective, choice. It's all there. Thanks to all those who said those things before. I've just did a bit of research on Isshinryu katas and origin. I believe it to be very similar to Chito-Ryu. I've seen a bit of it in practice. And it seems very similar. The feet positions are different. But other than that, techniques are very similar. Isshinryu's Gedan Barai is mostly like Goju's one. Ours is more like Shotokan's. Strangely, it makes more sense to me when I see yours being performed. To deflect the attack. Your positions are more like Goju's positions. More or less, these three forms carry strong ressemblences. I wish I could see some of those basic forms, Shuri-Te, Naha-Te. Since all of karate seems to take root in those forms and adapt them for particular goals. Thanks for your words of encouragement! It's so good to be back. John: This is very timely for me, with the very recent loss of a family member and a beloved pet. Definitely disheartening and although I don't find them necessarily *unacceptable,* it's still difficult emotionally. I have a 'tranquility' plaque (with the Chinese symbols for the word) in my spare bedroom where I often do Yoga, but right now going with the flow is really key. Thank you for posting, and I'm glad I took a look. "Strength in adversity" How true! I lost 3 relatives before I was 30 years old - including my parents. That was 10 years ago this year. While it is always a nice anecdote, the myth about Pep winning the 3rd round of his bout with Jackie Graves is just that: a myth. Newpaper accounts of the time count the 3rd round as the most hectic of the whole fight. You shouldn't be able to win a fight without throwing a punch anyway. But since it is such a nice anecdote to have, it will be a popular one for years to come. Are you sure it's a "myth"? I can't say I've ever seen the scorecards for the Jackie Graves bout (Minneapolis, 7/25/46, Pep won by KO in 8), but the story is that Pep actually tipped off some of the newswriters that, indeed, he would not throw a single punch in round three. All three judges gave Pep the round. Of course nobody should win a round without throwing a punch. Newspaper accounts say that in the third round the action was such that “A clicker couldn’t count the blows.” The myth also did not surface until many years (decades even) after the bout. I'm citing Jake Wegner from the IBRO Journal #82 as my source. Another boxing related myth proven almost certainly false is the story of a condemned black man crying out for Joe Louis to save him. Joseph Svinth debunks that myth (largely propagated by Dr. Martin Luther King!) in Journal of Combative Sport (April 2005) and as he concludes it is too bad, because if King's story isn't true, it should have been.